Should Spain Close Franco's Tomb? Every year around this time, a tempest brews in the mountains just north of Madrid. On the weekend closest to Nov. 20, devotees of Francisco Franco, who died on that day in 1975, travel to the elaborate basilica-turned-mausoleum called Valley of the Fallen, where he is buried. There, they pay homage to the general who ruled Spain as dictator for nearly 40 years. Because the site is owned by the state, the event produces heated complaints over the Spanish government's continued financial support for what some see as a monument to fascism. But this year, it isn't just the leftists who are up in arms; the small band of monks who oversee the basilica have their own reasons for gently rebelling. 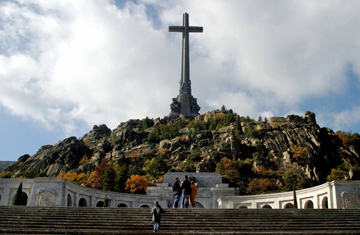 One year after his Nationalist forces won the 1936-39 civil war that ignited when he helped stage a coup against Spain's democratically-elected government, Franco commissioned the Valley of the Fallen as a monument to the war's dead. When it was at last inaugurated in 1959, the dictator dedicated the site to "all the fallen" and had the bodies of Republican soldiers disinterred and re-buried there. Yet because the monument was built in part by the forced labor of political prisoners, and because its most striking icons  from the Pieta at the foot of a massive, 490-foot cross, to the looming statues of crusaders that line the walls of the underground basilica  were emblems of the dictator's National Catholicism, the Valley of the Fallen has always been closely identified with the war's victors. The presence there of the tombs of both the founder of Spain's fascist party and Franco himself only reinforce that association. "The idea that this is a monument for all the dead is historically inaccurate," says Julian Casanova, professor of history at the University of Zaragoza. "It's like building a pyramid and saying it's not about the pharaoh buried there." Which is why several thousand Spaniards will trek to the Valley this weekend. For many, it will be an opportunity to commemorate the dictator's passing with a funeral Mass. Others will punctuate their march from Madrid to the monument with fascist salutes and songs. And all of them will be met by another group, smaller but no less fervent, who will be there protesting the fact that the government continues to financially support the place. In Spain, a country that has yet to completely reconcile the divisions created by its brutal civil war and nearly 40-year dictatorship, this is all business as usual. But this year, Nov. 20 brings with it an added complication: the basilica is shut. Two weeks ago, the government institution that oversees the national patrimony closed access to the monument's interior for renovations, citing a dangerous state of disrepair. "There was a problem with several of the stone sculptures, including the Pieta, that were falling apart," says a source within the National Patrimony office. "We had to close it to the public." The tourists who make Valley of the Fallen one of Spain's most visited sites have largely been understanding. But that is not necessarily the case with the basilica's overseers. In 1957, Franco had a monastery installed at the site and ever since, the twenty or so Benedictine monks who live there have conducted Mass inside the church. Last week, unable to welcome the public into the church, they instead held the service outdoors. "The Law of Religion protects worship," says Father Anselmo, the monastery's abbot. "We celebrated the Eucharist with dignity and serenity, while exercising our freedom of belief." Some Spaniards, who have watched the socialist-led government pass a Law of Historical Memory that eradicates statues of Franco from public spaces and bars the "exaltation" of his regime, see the basilica closing as an attempt to suppress the homages that normally occur around this time of year. "I don't know what their motives are," says engineer Juan Ignacio Tortosa, 45, who attended the outdoor service. "But I do know that if the abbot hadn't made this decision to hold the outdoor service, the government would have had the good luck of no one showing up this weekend [for the commemorative Mass]. Indeed, this year's polemic occurs against a backdrop in which the future of the Valley of the Fallen is in doubt. Several political parties have argued that it should be turned into a museum about the civil war, while other groups have demanded that, at the very least, Franco's body should be removed and re-interred in his family's plot. The Forum for Historical Memory, an organization that represents the families of Franco's victims, even suggested recently that the whole complex should be "blown up." At the offices of the National Patrimony, they deny having any motive other than keeping the public safe, and expect the basilica to re-open by the middle of December, if not sooner. In the meantime, Father Anselmo will conduct another outdoor service this weekend, this one a funeral rite held in the memory of "brother Franco." It's true, Father Anselmo admits, that there will likely be a small group of people who spend a few minutes after the service giving fascist salutes and singing the Falangist theme song "Cara al Sol." But he, too, stresses that his actions are not political. "The Valley of the Fallen is about reconciliation," he says. "Reconciliation through a religious path." But given the continued debate over what the monument signifies, true reconciliation seems far off. As this weekend demonstrates, unending controversy and conflict are far more likely.